Demo Impressions: Lost Planet 2 - This Is My Joystick! 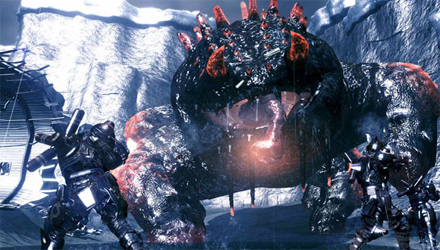 Some time ago, in 2006, Capcom released a little game called Lost Planet, but it never really caught my eye nor appealed to me much until the sequel was announced. It all started around the time of Resident Evil 5′s release when Capcom were hyping their amazing zombie-killing game, when a mysterious video appeared on our Xbox Dashboards announcing a secret Capcom title by Resi director Jun Takeuchi. This alone got people downloading the video just to see what all the fuss was about, and it was the announcement of Lost Planet 2. This is where my interest began. Last week, the Lost Planet 2 demo hit the Marketplace and I was one of the first people to download and burst this demo wide open, and I have to say, for a demo, it really serves its purpose. I actually want to go out and buy this game no matter how much it costs. The first thing you notice is the lobby system, it is so easy to use and no need for guide button navigation to invite friends; just click the LB button and you invite your party into play instantly. There are no long waiting times for finding players and play starts instantly. The game doesn’t really have a tutorial apart from a few sign posts which you read, and these give you the basic controls; the rest is down to you. I invited my mate into a game to test the demo out and within seconds we were fronted with one of the biggest creatures I have encountered in a game before. Not only were we shocked by its size, but the details and textures were enough to make your mouth water. After you look at the massive creature and get your head around what it is supposed to be, you then have to figure out what to do. The only instructions you get are “Defeat the Category G” then a bit later on “Infiltrate the body”. That is it. The rest you have to figure out on your own, but I will tell you that pounding it with bullets is not the best way. The new thing about Lost Planet 2 that really distinguishes it from its predecessor is the co-operative campaign. The demo utilizes the co-op mode really well, as I said previously, the lobby system is easy to use but once you get into the game it gets better. Despite potential connection problems from friends, there is no lag. We tried with both good and bad connections and had no problems with gameplay, there were a few issues with speech but that’s a given. There is a weird health regeneration process where you use what’s known as a “Harmonizer” to restore your health, but what do you do if your harmonizer runs out? Your fellow team mates can sacrifice some of their harmonizer power and give it to you in little bursts by shooting energy balls at you. Other co-operative features include battle suits with more than one chamber; for example, someone walks and the other shoots, and some other hidden features that I shall not give away. The gameplay is quite easy to get to grips with. I am used to games such as Call of Duty where my sensitivity is set to 8 and I whizz around the screen, so when I started playing Lost Planet 2 the controls seemed slow and sluggish, but that’s not the game… that’s me. The controls were initially complex, but easy to grasp after a short play. For example, to shoot harmonizer energy at your team-mate you have to hold Y and press LT to shoot, and normal grenades are just LT, so if you forget to press Y you blow up your team mate. Pressing the X button utilizes the best grappling hook I have ever used in a game. If there is a surface, you can grapple it. Just aim, press X, then A to jump off and it’s as easy as that. It makes getting on top of the Category G much easier. Whoops… just gave away another strategy plan! The graphics on this game are stunning. Everything shines as it’s supposed to, capes and clothes react realistically with wind and rain, and the Category G, as I said above, leaves you paused in motion just gawping at the sheer scope of it. There are some camera issues when it comes to enclosed spaces, and it still feels sluggish to me, but there are some 90 degree turn buttons mapped to LB and RB so that may help, although I never used them. Visually it ranks alongside the best looking games on all platforms, but it has that Capcom uniqueness as seen in Resident Evil 5 with slightly cartoonish character faces. On first impressions, I really want to continue and play more levels like this. It is a long-winded demo and does take some time to finish but I can guarantee that after you win or lose, you will immediately want to play again. At the moment there is no release date or window set in stone, but when those details get announced, you can bet this will be high up the pre-order charts.